How we love earthy, leaf-strewn Autumn at Garden Requisites. Some say that Spring is the classic season for a clear-out but we find, when the weather is wilder outside, November is the time to regroup and re-organise with clear heads, to consider what’s worked, what needs a bit of tweaking and what needs a radical rethink. Time to take stock and start prepping well ahead for a busy year of fresh growth, inside and out! Looking out at the old weathervane, our autumnal winds are most often Sou’westerlies here, pushing up and gathering pace as they roll in from the Cornwall, Devon & South Somerset. With each of these cooling blowy blasts, we’re pleased to see the garden’s underlying framework revealed again too and to consider sculpting new shapes for next year. Full of fresh ideas as a result of seeing the garden’s structure laid bare, it’s such a pleasurable past-time of a long winter’s evening to light a fire, root out notebooks and sketchbooks and plan next year’s seasonal outdoor symphony for your garden space. Garden designers too can focus on new plans and layouts with more time to research and update materials and signature plants. What’s on your mind for this winter’s planting as well next year’s border shows? Would you like to introduce more shape and height to the garden? More colour? Different colour schemes? A switch in plant types? More surprise and delight? More secret nooks to escape to? More of a welcome for local wildlife? Starting with clear objectives and sticking to them will simplify the process. Once you have structure in mind, you can only then dive into the myriad of planting possibilities which can be happily applied to specimen hungry borders, planters, troughs, window boxes, trellis, obelisks, arches, gazebos and beyond. As well as evergreen shrubs and trees, deciduous trees and bushes with eye-catching berries and bark will glow through the gloom on greyer days. We absolutely love the painterly purple berries of Callicarpa bonieri, for instance, or how about the knockout fragrance of Daphne odora? Take a look at our Winter Planting Pinterest board to explore more ideas as we wrap up and stroll through frosted architectural seed heads, sculpted Holly, divine Hellebores, bright-barked Cornus, swathes of Snowdrops, golden Winter Aconites and more. In the midst of all this winter planting planning, the height of smart shaping in the garden has to be the introduction of a well-made metal garden arch, arbour or show-stopping gazebo. Whatever the choice of structure, do ensure that these important features are well-crafted and finished to withstand the rigours of the fiercest elements as well as the shifting weight of top-heavy stems and foliage. For the installation of Garden Requisite’s long-lasting garden arches, November in England, when the ground is not too soggy or frozen hard, is an ideal month to sink in the 15’’ legs of the two arch halves, either pushed in or positioned in concrete for serious stability, then fixed together at the top. Our elegantly designed zinc-galvanised steel lattice wirework arches sit beautifully with freestanding trellis fencing or complementing garden gates, something to be considered in your sketchbook ideas. 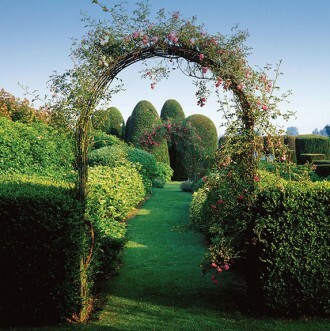 Autumn garden arch insertion is also ideal timing to get ahead of planting bare root roses, rambling and climbing, which need to be in the ground before it hardens. Whilst the plants are young and low, the arches can be lifted with pretty fairy lights and can also be a really pleasing and dynamic focal point for hanging birdfeeders. With a variety of shapes including Roman and gothic designs and also painted finishes in the wings, do give Hilary or Marsha a call to discuss the sizing and fixing of an arch. As well as 5’, 6’ and 7’ wide arches, we can discuss bespoke widths and heights. Remember, remember to install your arch by December!